Moses Waisswa will miss out on the 2018 CHAN tournament. Courtesy photo. Ahead of the 2018 CHAN tournament, FUFA has released a 30-man provisional squad from which 23 players will be selected to feature in the tournament slated for January. The list of the 30 players was released today, Tuesday 26 by the Federation of Ugandan Football Association. It includes three goalkeepers with the usual suspects Ismail Watenga, Proline’s Saidi Keni and the inconsistent KCCA FC number two Benjamin Ochan. CECAFA and SC Villa captain Bernard Muwanga leads a list of eight defenders, including new revelation Mustafah Pizza of KCCA and out of form duo Joseph Nsubuga and Shafick Bakaki. KCCA trio of central midfielders in Saddam Juma, Allan Katerega and Muzamir Mutyaba are all in along with Vipers’ Tadeo Lwanga and Tom Matsiko but second top league goal creater Moses Waiswa misses on the list. 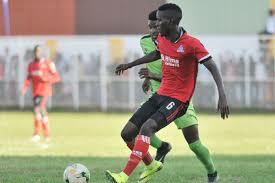 This is the second tournament in a raw that the Vipers’ attacking midfielder misses after he was also over looked at the just concluded CECAFA Senior challenge cup in Kenya. Waists has so far made six assists in the league, only second to KCCA defender Mustafah Kizzawho has eight. With the Cranes of late struggling in terms of creating chances, it is hard to understand why the most creative midfielder in Waiswa has been dropped. Reigning COSAFA under 20 top scorer Muhammad Shaban he also been summoned as one of the strikers along with club mate Derrick Nsibambi. The team starts training in Wednesday 27 at Mandela national stadium in Namboole. Watenga Isma (Vipers Sc), Ochan Benjamin (KCCA FC), Ikara Tom (J-Kirinya SS), Saidi Keni (Proline FC) Wadada Nicholas (Vipers Sc), Nsubuga Joseph (Sc Villa Jogoo), Muleme Isaac (KCCA FC), Madoi Aggrey (Police FC), Awanyi Timothy (KCCA FC), Muwanga Bernard (Sc Villa Jogoo), Bakaki Shafiq (Vipers SC), Lwanga Taddeo (Vipers SC), Masiko Tom (Vipers SC), Saddam Juma (KCCA FC), Mutyaba Muzamiru (KCCA FC), Karisa Milton (Vipers SC), Mucureezi Paul (KCCA FC), Kateregga Allan (KCCA FC), Kyambadde Allan (SC Villa Jogoo), Nsibambi Derrick (KCCA FC), Shaban Muhammad (KCCA FC), Senkatuka Nelson (Bright Stars FC), Kaweesa Hood (Police FC), Isiagi Daniel (Proline FC), Mujuzi Mustapha ( Proline FC), Kasule Abubaker (Express FC), Kagimu Shafik (URA FC), Kasozi Nicholas (Sc Villa Jogoo), Ahebwa Brian (Mbarara City FC), Kiiza Mustapha (KCCA FC).